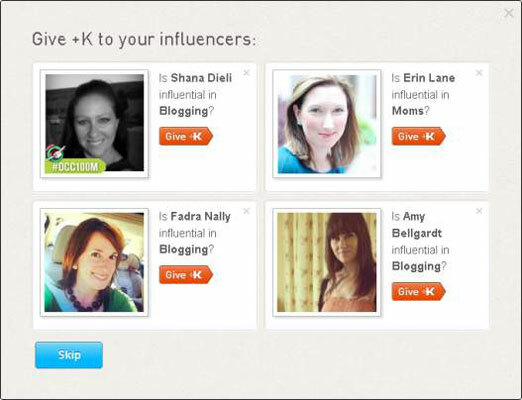 To give +K to another influencer, you must be logged in to Klout via your computer or mobile device. 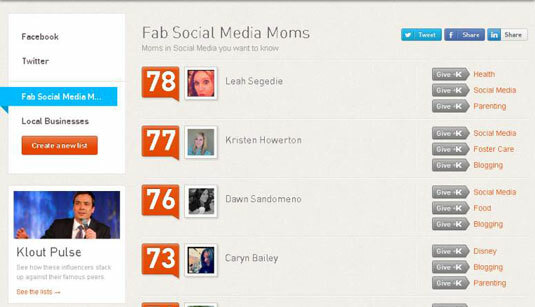 You can endorse another influencer in a couple different places within the Klout website. You can endorse an Influencer via her profile page or a list you’ve created; you can then endorse someone else via the confirmation box you see after you endorse someone. It doesn’t cost anything to tell people they’re doing a great job. And you might just make their day! Log in to Klout.com by signing in with either your Twitter or Facebook account. Select Friends from the navigation menu at the top of the screen. On your Friends page, select one of your lists from the sidebar on the left side of the screen. All of the influencers you’ve added to this list appear in the main column of the page. Each influencer has three topics to the right of her name. These are the top three topics for which she is believed to be influential. To give +K in one of these topics, select Give +K on the topic you wish to endorse. If you don’t see the topic you want to endorse in the top three selected topics, you may choose to view the influencer’s profile for more options. 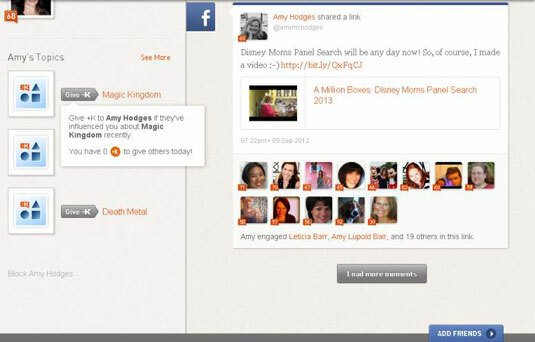 Make sure you are logged in to Klout.com by connecting with your Twitter or Facebook account. Type an influencer’s name in the search bar and select them from the list of influencers that appears. Scroll down until you see Topics in the sidebar on the left of your screen. Mouse over a topic and select the See More link that appears. A pop-up window with a list of topics appears. Select the topic you wish to endorse by clicking the Give +K button next to the topic. To return to the topics list, close the confirmation box by clicking the x in the upper-right corner. When viewing your confirmation box, notice that you have the option to share the fact that you gave +K to this influencer via the Twitter and Facebook sharing buttons. Klout also tells you the number of +K you have left to dole out for the day. If you would like to give +K to more influencers, you can do so right from the confirmation box. After you’ve given +K to an influencer, a confirmation box appears with the You Have +K Left to Give to Others link. Click this +K link to continue giving +K. A pop-up box appears with influencer suggestions to endorse. Selections are posted at random from your online influencers. This is a quick and easy way to endorse people. If you agree with the statement, simply click Give +K. If you don’t want to endorse any of the four people listed, click the Skip button to be given a list of four new influencers and topics. Continue endorsing until you reach your daily maximum.